Blowout Sale! 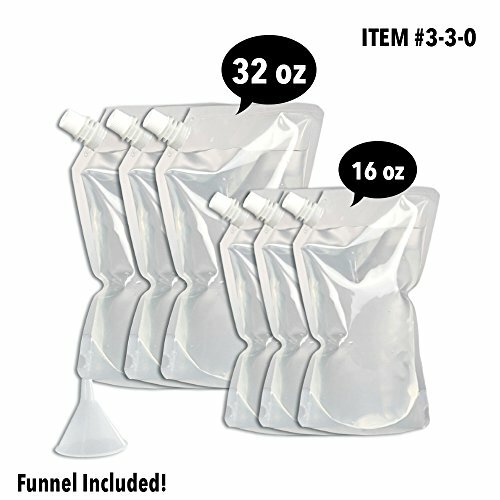 Save 60% on the Concealable And Reusable Cruise Flask Kit - Sneak Alcohol Anywhere - 3 x 32 oz + 3 x 16 oz + 1 funnel by Cruise Flask® at In The National Interest. MPN: 1. Hurry! Limited time offer. Offer valid only while supplies last. SNEAK ALCOHOL ANYWHERE, AND SAY NO TO OVERPRICED DRINKS! GOING ON A CRUISE? Do you want to avoid the outrageous cost of Alcoholic drinks on board? SNEAK ALCOHOL ANYWHERE, AND SAY NO TO OVERPRICED DRINKS! Do you want to avoid the outrageous cost of Alcoholic drinks on board? Don't spend hundreds of dollars anymore on drinks, and sneak your own beverages instead! These Heavy Duty Reusable and Concealable Flasks for Booze & Cocktails will allow you to enjoy your vacation a lot more. The CRUISEFLASK® Kit is perfect for sneaking your liquor onto any cruise ship, inside your luggage. They are High-Quality, very durable, leak-proof, puncture resistant, and BPA FREE! The nonmetallic material makes them undetectable by scanners and metal detectors, and they are specially designed to pass through screening without being noticed. Now you can have fun without breaking the bank on booze. So, go ahead, and pack a CRUISEFLASK® Kit loaded with your favorite beverage. NOT GOING ON A CRUISE? Our Flask Kits are also perfect for taking any non-carbonated beverage to Concerts, Stadiums, Clubs, Bars, Movie Theaters, Tailgating, Glass-Free Beaches, Pool Parties, Fishing, Hunting, Camping, Golf, etc. 1.- Wash flask with soap and water, rinse thoroughly, inflate flask with a puff of air, turn upside down with cap off, and let dry. 2.- Use funnel to fill the Flask to no more than 80% of its capacity. 3.- Hold the Flask with the spout up and squeeze to expel air until liquid is in spout. 4.- It is recommended to remove and discard the O-Rings from the caps, and twist the caps as tight as possible to avoid leakage. 5.- Do Not Fill With Carbonated Beverages. PLEASE, DON'T WASTE YOUR MONEY ON FAKE AND CHEAP COPIES! 100% ORIGINAL CRUISEFLASK® Brand - SAY NO TO CHEAP IMITATIONS! If you have any questions about this product by Cruise Flask®, contact us by completing and submitting the form below. If you are looking for a specif part number, please include it with your message.